Library image #2299: View of Eagle Peak and summit trail from the shoulder of Warren Peak. The United States Congress designated the South Warner Wilderness (map) in 1964 and it now has a total of 70,206 acres. All of this wilderness is located in California and is managed by the Forest Service. In far north eastern California, you will find the Warner Mountains and the South Warner Wilderness, which stretches about 18 miles long and 8 miles wide. Elevations vary from 4,760 feet at the east boundary between Owl and Hornback Creeks in Surprise Valley, to 9,892 feet on Eagle Peak, a conspicuous landmark near the center of the area. Gently rolling topography on the western side, is highlighted by mountain meadows and clear streams, forested with mixed pines, firs, and aspen. The eastern side, however, rises abruptly to rugged country dominated by ragged peaks where vegetation is sparse. Wildflowers bloom in abundance. Severe storms have been known to roll in every month of the year. Eight trailheads provide access to about 79 miles of maintained trails suitable for horse or foot traffic. . 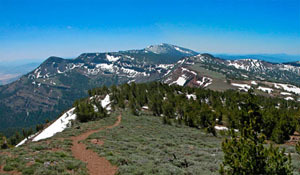 The Summit Trail, which rambles 22.5 miles north-south, travels through the heart of the Wilderness. Use of these trails is light. Horse users will find outstanding opportunities for quiet travel in majestic surroundings. Planning to Visit the South Warner Wilderness? How to follow the seven standard Leave No Trace principles differs in different parts of the country (desert vs. Rocky Mountains). Click on any of the principles listed below to learn more about how they apply in the South Warner Wilderness.